You'll be £14.99 closer to your next £10.00 credit when you purchase Aisne 1918. What's this? This battlefield guide and history will focus mainly on the events of attack that fell on the British sector of the front between the 27th – 1st June 1918, although the offensive which also befell the French forces will not be totally neglected. This area had been a French held sector since 1915 and the French had fought one of its major engagements of the war here in 1917, the ill-fated Nivelle Offensive. French monuments and cemeteries dominate the landscape. The British were also here in 1914, and they too have left reminders of their relative brief presence. However, the actions fought here early in the war tend to be found mainly to the west of the sector. The battlefield of May 1918 scales the heights of the Chemin des Dames ridge, along the Californe Plateau and descends to afforested valley of the Aisne river and canal. The retreat of the Britsh forces during the course of the first day and in following days extends further south almost to the Marne and takes in part of the Champagne region. Overall this is an excellent detailed history of the first day of the fighting on the Aisne on the British front, but could have done with more detail on the later phases of the battle. Employs the established and successful Pen & Sword format; a narrative of the battle and those involved, the important general touring advice for the tyro and two motor tour routes and walks. Aisne 1918 is an excellent work about one of the lesser known battles of the Great War. The publisher has built an outstanding catalogue of battlefield guides and 2016 marked an expansion as part of the centenary events marking WWI. This book is a very worthy addition and provides excellent illustration and clear concise text. Essential companion on a battlefield visit. This well illustrated title in the Battleground Europe: North West France series provides a concise, yet comprehensive account of the Third Battle of the Aisne (May 1918), which was a battle during the German Spring Offensive during the Great War, by which the Germans attempted to capture the Chemin des Dames Ridge before the American Expeditionary Forces established themselves in France. It was one of a series of offensives, known as the Kaiserschlacht, launched by the Germans in the spring and summer of 1918. Using contemporary quotes, numerous monochrome illustrations and a number of tactical maps, the author provides a knowledgeable and readable account of this critical action. This handy new title joins over 150 published titles in the Battleground series. This title joins over 150 books in Pen & Sword's much acclaimed 'Battleground' series, which form part guide and part historical narrative, appealing in equal measure to both general readers and to those visiting the battlefields and wanting to get more from their experiences. Always very well researched and well written this series combines into an excellent reference for anyone interested in the Great War. This work covers the Aisne area of 1918 and is filled with facts and figures and personal stories which bring the area to life and give a poignancy to any visit. 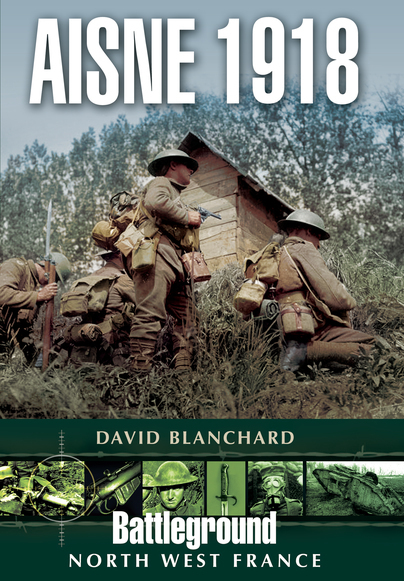 David Blanchard’s Battleground Europe: Aisne 1918 is a unique guidebook to the largely ignored British actions on the Chemin des Dames near Reims in May 1918 when British divisions sent their for a rest after actions on the Somme and Lys in March-April 1918 found themselves under attack for a third time. The author has been researching this for many years and this shows in the depth of knowledge in the book and the many never before seen images and accounts. The tour section is first class with some good leads on what to see and visit, excellent maps and information. Exactly what the centenary should be about: introducing us to areas that many have genuinely never before explored either in print or on the ground. Highly recommended. The guide starts with the story of the Allied troops and their Dispositions, discussing the dfence of the Chemin des Dames and the Californie Plateau. It moves through the Defence of the Woods and the Aisne River, the Defnece of the Aisne Canal and then the rear-guarded actions that took place up to the 6th June. These sections are well explained, including many memories from those who were there and kept diaries or otherwise recorded their memory of events and along with photos of those men as well as archive photos of the battlefield. Maps are featured as well which helps give the picture of the battlefield. The history takes up roughly two thirds of the book and the final third is devoted to the tours you can make to see the main points of interest that remain in the area today. There are three detailed tours described, one to be done by car and the other two for walking. Then there are sections that look at the many memorials in the region, such as the Soissons Memorial to the Missing, and then both the British and German War cemeteries that are in area. With appendices that give the British and German Order of battle it provides a very useful collection of tour advice coupled with the background information to help appreciate what you see today. This is another excellent guide to have with you in your car or backpack if you are considering a visit to the area. ... A very good book indeed and for my money one of the best of the “Battleground Europe” series.